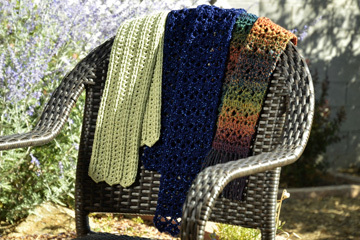 Each of these 3 scarves takes just one skein of yarn to crochet. The stitch patterns give the scarves lots of visual appeal while challenging the crocheter just slightly! Why not whip up a new scarf or two for a loved one, a friend or yourself today! Each pattern includes full written instructions, as well as a symbol crochet chart, for those who prefer a visual representation of the project! Each scarf pattern (Pediwick, Autumn Romance and Glamour) is available separately, or purchase all 3 scarf patterns in this specially priced set.